Do you know someone who loves to ride their bike, but really only on the Lakefront Trail? They're not alone. I spent many years riding only on the side streets to and from the LFT, which served as 95% of my commuting and recreational purposes. Many people are anxious at the thought of sharing a street with moving motor vehicles. 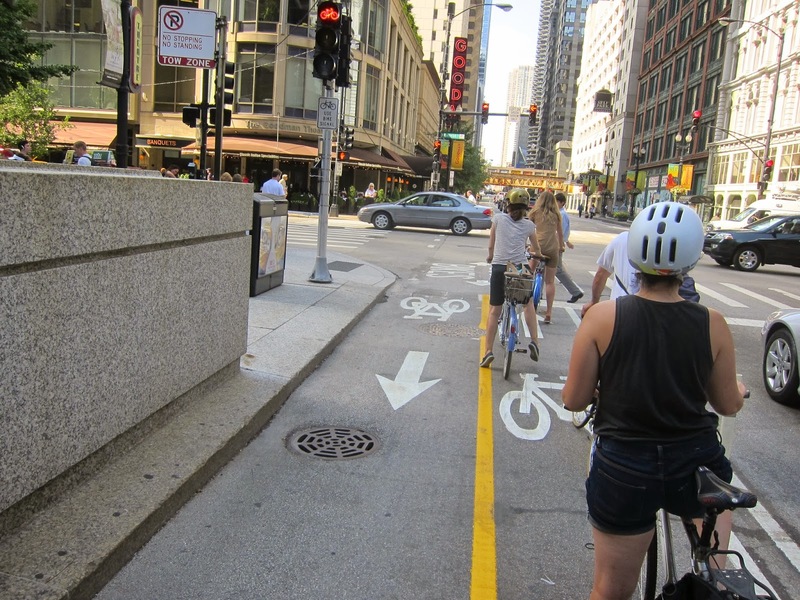 However, Chicago streets have benefitted from the addition of miles of bike lanes of various types, which are a great help to keep vehicles separated as much as possible, and to raise the comfort level of people new to urban bicycling. To help encourage people to go "Beyond the Lakefront Trail", we're hosting a social ride next Saturday that will give people a chance to practice riding on Chicago's streets. Riding in a slow-moving group of people raises comfort levels, because the group's mass increases the visibility of the riders to drivers, and they tend to keep a wide berth. In addition, when I first joined group social rides, I quickly learned that when you don't have to worry about "where to go" next because you can just follow the people in front of you, it allowed me to relax and enjoy the experience. Plus, it's fun to chat with other people. Below you can see the map of our planned route, which is about 10 miles long. Michael Reynolds and I will lead the ride. We'll start and end in Lincoln Park, and go through Old Town, River North, the Loop, West Loop, Noble Square, and Bucktown on the way. Participants will experience "old style" bike lanes, buffered bike lanes, shared marked lanes, and protected bike lanes, including the famous Kinzie and Dearborn lanes. We'll stop for breaks every few miles, including a coffee shop stop. Doesn't that sound fun? The map of our Beyond the Lakefront Trail ride. The streets are Wells, Kinzie, Dearborn, Kinzie, Milwaukee, Division, Wolcott, Milwaukee, Damen, Cortland, Racine, Armitage. The ride is open to people of all experience levels, and in fact, we'd like to have many experienced, confident participants as well, to help provide that mass of people on bikes that makes a group ride so fun and safe. Note that although this is not a "family bike ride" per se, children are welcome if they can endure 10 miles on their bike seats or in the bike trailer. We'll be travelling quite slowly, at a pace that most kids about 8 or 9 and up could handle. 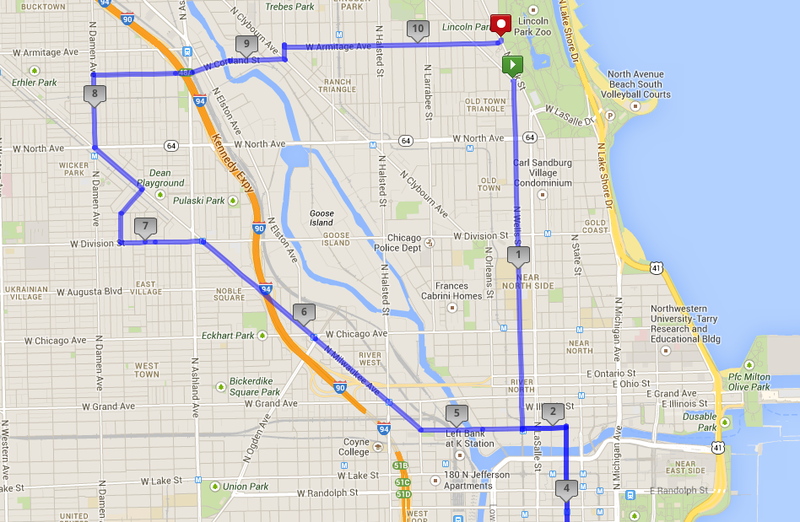 You don't have to live in or anywhere near Lincoln Park to join this ride. We're radically inclusive here. You have a bike? We hope you join us!